Sri Lankan President Mahinda Rajapaksa has been ranked as the 17th worst person in history by a website that has compiled a list that includes 50 such notorious non-fictional personalities. Mahinda Rajapaksa has reached the 16th position obtaining a total of 7540 votes at the time of writing, while some 1688 votes had been cast against the position in the list that has been compiled by the ‘Ranker’ website. 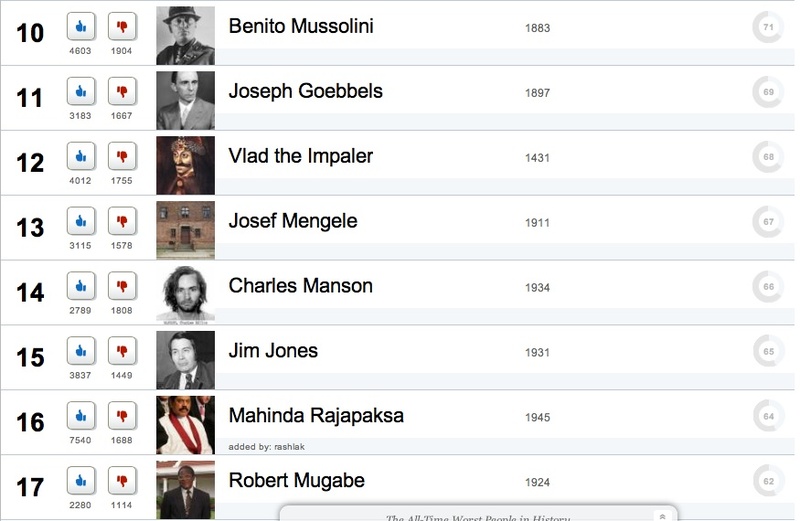 Noting the criteria used to select the personalities for the list, the Ranker states it is a collection of ‘horrible, read (not fictional) people who have committed historical crimes.’. “History judges them, and so do we,” the website states. Meanwhile, Mahinda’s baby brother and Sri Lanka’s Secretary to the Ministry of Defence Gotabaya Rajapaksa has been included in the same list and currently ranks as the 29th with a total of 1261 votes in cast in favour of the position. Among the 50 ‘horrible’ people are Joseph Stalin – ranking number one with 12572 votes – as well as several other sordid characters such as Idi Amin, Pol Pot, Saddam Hussein, Jeffrey Dahmer,Slobodan Milosevic and George Bush. In short, the list is a compilation of most infamous mass-murderers, psychopathic serial killers, sociopathic religious leaders, dictators, deceptive political commentators etc. The list is open for voting – making it an accurate, real-time ranking of the ‘world’s worst people’ and some 348, 406 votes had been cast for the list at the time of writing.